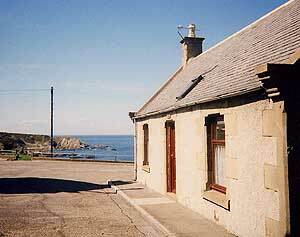 Lismore Cottage offers superb self catering accommodation in Portknockie near Buckie. This cottage in Banffshire is the perfect place to stay for a relaxing and peaceful break away. The cottage sleeps up to 4 people all on one level & has stunning views of the harbour, cliffs and Moray Firth. The tastefully furnished living room comes with Freeview TV and enjoys sea views. The fully equipped kitchen comes with a range of excellent appliances. There are two comfortable bedrooms & a newly renovated bathroom. A range of superb attractions are nearby. You can visit the beautiful harbour or stroll along the cliffs and coves. Caves and a sandy beach are also nearby. The coastal villages of Findochty and Cullen have a number of lovely walks to enjoy. Nearby there are golf courses and the famous Whisky Trail.